Kerry van der Jagt reveals the quiet side of Abu Dhabi and Dubai, not so far from the tourist haunts. It is early morning when we lower our canoes onto the still lagoon. The Arabian sun rises slowly over the mangroves, giving life and shape to the shoreline. In the distance, the modern skyline of Abu Dhabi stands like a cardboard cutout against the sky. The Eastern Mangrove Lagoon is to the south-east of the city, a 15-minute drive from the skyscrapers of the United Arab Emirates capital. The main attraction here isn't a labyrinth of luxury high rises, rather, a tangle of mangrove tunnels, home to flamingoes, foxes and the aptly named "Crab Alley". The Talise Ottoman Spa is the largest in the Middle East. When the glitz and glamour of Abu Dhabi and its big sister Dubai begin to lose their shine, laid-back gems such as the ones here provide a dose of reality. All are within reach of the cities and are sure to add another layer to your experience of the Middle East. As we push off, the canoes slice through the jade-green water, startling a pair of herons from their perch. "Keep your eyes out for the Arabian red fox," whispers Jefferson, my guide and paddling partner for the morning. When we stop at one of the sandy beaches, Jefferson points out paw prints. At another beach we see flamingoes lined up on the shore like sticks of fairy floss. "A flamboyance of flamingoes," remarks one of the kayakers. Our group of paddlers includes a pair of expatriates from Dubai and four local Emirati women, none of whom knew such a treasure existed on their doorsteps. "This is the biggest mangrove forest in the United Arab Emirates," Jefferson says. "In summer, the flamingoes arrive. In winter, we have dolphins and dugongs." In single file we cross the lagoon and enter the narrow, vein-like tributaries. High tide means we can almost touch the mangroves on either side. It's muddy, messy and furiously wild, a rarity in a city polished to within an inch of its diamond-encrusted life. "The only cranes you'll see in here are the feathered variety," Jefferson jokes. Eastern Mangroves Hotel and Spa by Anantara is on the waterfront and offers two-hour kayaking tours for 150 dirhams ($43). See abu-dhabi.anantara.com. For centuries, falcons have been revered in the Middle East for their hunting ability and beauty. "To Europeans, falconry was about prestige but to Gulf Bedouins it was about survival," the director of the Abu Dhabi Falcon Hospital, Dr Margit Muller, says. "To this day Emirati treat their falcons like their children." So it is fitting that the capital of the United Arab Emirates is home to the world's largest falcon hospital, treating more than 7000 falcons each year. The specially trained vets perform procedures ranging from beak maintenance to orthopedic surgery. The hospital offers tours to allow interactions with falcons. "We also wanted to give people a cultural understanding of our falcons," Muller says. "Even though hunting is no longer allowed in the UAE, the falcon is still a symbol of the UAE national identity." Not only are these pampered pets allowed to travel in the cabins of the national carrier, Etihad Airways, they also have their own passports. The passports were introduced to monitor the movement of birds protected under the Convention on International Trade in Endangered Species. I watch as a large Saker falcon is given an anaesthetic before undergoing a check-up and talon trim. In the same room, there are a dozen other falcons, lining up on wooden benches with their bonnets in place, waiting their turn like well-behaved school children. "We are not talking about birds here," Muller says. "We are talking about family." 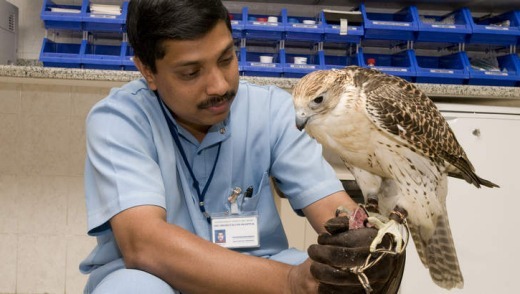 Abu Dhabi Falcon Hospital runs tours from Sunday to Thursday at 10am and 2pm. The tours cost 260 dirhams and bookings must be made in advance. See falconhospital.com. Dining is one of the joys of visiting Dubai. A new food walking tour launched in January by local food blogger Arva Ahmed offers an alternative to the usual white tablecloths in restaurants of the city. The Frying Pan Adventure tours take place on the streets of Deira, the unfashionable part of town where Arva grew up, and where tourists rarely go. Located on the north-east of Dubai Creek, Deira tends to be where the workers of Dubai live. Rough and raw, but delightfully real, the streets are a riot of spice markets, sweet shops and shabby, but in no way chic, restaurants. "Tonight our tummies will visit Lebanon, Palestine, Iraq, Yemen, Jordan, India, Africa, Egypt and Iran," Arva says. Over the course of our four-hour eating marathon, we visit 11 different places, sampling everything from Jordanian mansaf (a Bedouin dish of goat served with hummus) to manakish (a Lebanese pizza with Armenian sausage) and zaatar, a salad of blended spices. We also fill our faces with crisp falafels, Iranian kebabs, tangy yoghurts, fresh nuts and honey-drenched desserts. Our last stop is a Yemeni restaurant, where we sit on cushions inside tents, tucking into mandi, a buttery chicken dish served with rice and dips. Arva demonstrates the Bedouin way of eating with fingers and leaves us with one rule: "Stick to your own corner and make no land grabs across the floor." Frying Pan Adventures offers three food trails: North African Food Safari, Arabian Foodie Pilgrimage and Little India on a Plate, all of which are suitable to meat eaters and vegetarians. The four-hour walking tours cost 350 dirhams and include food, selected beverages and a guide. See fryingpanadventures.com. Operating under the motto of "Open doors, open minds", the Sheikh Mohammed Centre for Cultural Understanding (SMCCU) strives to remove barriers between people of different nationalities and raise awareness of the local culture, customs and religion of the UAE. When a young British boy puts up his hand and asks, "Why don't Muslims eat pigs?" and an Australian then asks, "Why do Muslim men have more than one wife? ", I'd say the barriers are well and truly down. Over a communal lunch of chicken bryan, vegetable saloona and saffron rice, two young Emirati women patiently answer our questions. Nothing is off limits from, "Why do you cover your hair?" (Modesty, privacy, tradition) to, "Can an Emirati woman marry a non-Emirati man?" (Yes, but he will not receive citizenship). I've joined 40 other visitors for a cultural lunch at the SMCCU's Bastakiya house, a typical wind tower house in the oldest Emirati neighbourhood of Bur Dubai. By the time coffee and dates are served, we are trying on burqas and discussing delicate subjects such as Shiites, Sunnis, alcohol and divorce. The SMCCU also offers cultural breakfasts, heritage tours, Arabic classes and tours of the Grand Jumeirah Mosque. The SMCCU runs tours from Saturday to Wednesday. 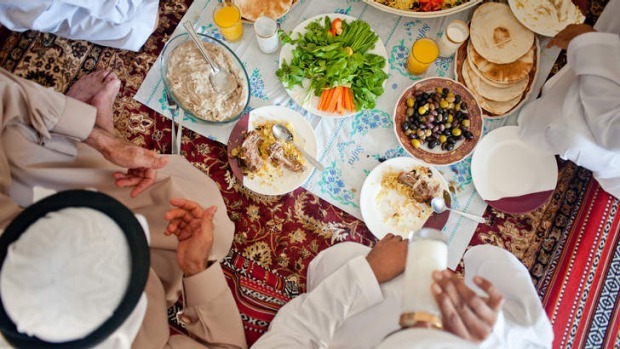 The cultural lunch costs 70 dirhams and bookings are required. See cultures.ae. In a fast-paced city such as Dubai, where covering up is the norm, one of the best ways to slow down is to strip off and be scrubbed, rubbed and oiled within an inch of your life. At the Talise Ottoman Spa, the largest in the UAE, Arabia meets Istanbul meets Marrakech. And, while the centuries-old Hammam spa is a symbol of Turkish and Ottoman culture, the UAE has adopted it as its own. The inside of the Talise Ottoman Spa is like a Moroccan palace, with its mosaics, murals and marbled floors. After enjoying the opulent surroundings, the treatment begins with a vigorous scrub using a kese mitt. At first, the marble slab I'm lying on is a little uncomfortable but, once the heat seeps in, I forget about it. By the time we get to the foam massage, I'm floating on thin air, and with the final hair wash and olive oil rub, I'm flying on a magic carpet. Hammam treatments cost from 400 dirhams. Jumeirah Zabeel Saray, Palm Jumeirah. See jumeirah.com. Kerry van der Jagt was a guest of Eastern Mangroves Hotel and Spa by Anantara and travelled with the assistance of Abu Dhabi and Dubai Tourism. Etihad Airways flies to Abu Dhabi from Sydney and Melbourne, from $2199 return; see etihadairways.com. Emirates flies to Dubai from Sydney and Melbourne, from $1940 return; see emirates.com. It is an easy 90-minute drive between the two cities. Eastern Mangroves Hotel & Spa Abu Dhabi by Anantara offers a quiet reprieve, just 15 minutes from Abu Dhabi airport. Rooms from 650 dirham ($185) a night; see anantara.com. Visit Abu Dhabi's Sheikh Zayed bin Sultan al-Nahyan Mosque (Grand Mosque). Open daily except Friday mornings. Dress codes apply. See szgmc.gov.ae. Take a wooden abra across Dubai Creek to the textile souk in Bur Dubai, where fabrics spill from the stalls gracing the narrow laneways. Costs one dirham (about 30¢) each way. Check out an art gallery in the old Fahidi neighbourhood of Dubai (Bastakia Quarter). Sit in a cafe and smoke a shisha. Everywhere you walk in the UAE you wıll come across an outdoor cafe with locals and expats relaxing with coffee and snacks while enjoying a shisha. Visit the low-key Dubai Museum, in the al-Fahidi Fort, the oldest building in Dubai (1787).